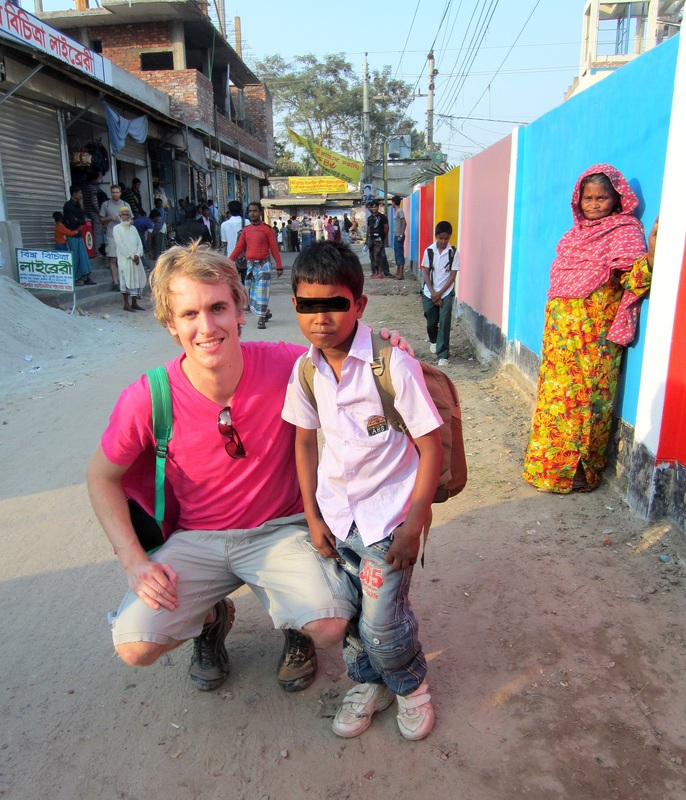 Submitted by Russ Johnson who blogs about life and misadventures in Bangladesh and Minneapolis. EAWs like to help people. The ideal of helping people is the very the reason they willingly choose to abandon their lives of comfort in developed countries for a life of hardship, tribulation, bad beer (if any at all) and slow internet in the developing world. Noble work, indeed, but this type of work needs recognition. Not for personal gain, of course, but rather to spread the word that people in their home countries can make a difference in the developing world too. But how to communicate this message of hope to those unaware naysayers back home living large in suburbia? Without knowing it, EAWs have come up with an unambiguous answer. They have realized that nothing communicates progress like the smiling faces of adorable village children surrounding an abnormally tall, gangly, white person who is grinning ear to ear because he feels loved and validated by these children. EAWs love taking pictures of village children to show all their friends and family. They love it even more when they can find a local who knows how to operate a point and shoot camera, a rarity indeed. When this combination of happy children, good fortune, and a camera savvy local presents itself, the EAW needs to make good use of the opportunity. In the age of the internet, where a 2G network can be found even in the rice paddies of rural Bangladesh, an adorable Facebook profile picture is only a thumb swipe away. Gather the children. Pose. Smile. Take the picture. Post to Facebook. BOOM, the girl the EAW was dating before he left home will see this picture and make up her mind at that critical moment; ‘I will marry this man’. The EAW’s family sees the new picture on The ‘Book and is proud to have raised such a fine EAW. The EAW’s elderly grandma ‘likes’ this picture, telling her friend circle at church about the important work the EAW grandson is doing ‘for the heathens’. Mission accomplished EAW. Now go home and marry that girl whose cold feet have finally warmed up. ‘But who are these children, and why are they so happy? I thought Sufferistan was supposed to be a sad place filled with poverty. The children don’t seem sad at all’, asks the wise observer back home. There are several reasons these children are smiling, the least of which are the results of the work the EAW is doing in the village. To begin, the EAW is the tallest person they have ever seen! He can carry six local children on his back without showing any sign of strain. The EAW also happens to be the palest looking white person the children have ever seen, probably because he or she is anemic from the tapeworm firmly attached to the small intestine. ‘Mommy, is that an evil spirit?’ Further, it’s quite possible the children don’t have a full-length mirror in their home, so they know this is their only opportunity to see how much they have grown since the last EAW came for a picture. Though young, these children are wise. They know that the more they smile, the more likely the EAW is to take the time to show each of them their picture on the LCD of the camera. Snap, snap, snap, the DSLR MEGA 5000 fires off pictures at dizzying speeds, the accessory POWER flash on the camera leaves the children wondering why they are momentarily blinded. As the children smile and laugh, talking to their friends in a language the EAW has not had the chance to master, it appears the EAW’s work has paid off, and one of those pictures is proof of it. ‘These children appreciate the work I do’, thinks the EAW, with a warm feeling in his heart that is not painful like the stress ulcer he has been suffering through the past five months. Meanwhile, the children’s mother stays quiet in the background, no smile on her face. It doesn’t have to be all bad, though. Using a Polaroid camera and a big box of film means the EAW can give one copy to the children and keep one for himself. The crafty EAW can turn his magnificent photos into an art exhibition, and use it to raise funds to do the project all over again! Look happier, girls! A random white person is taking pictures of you! I’ve been waiting for this post since this blog started. Seriously, every single EAW has a picture of themselves around brown children. I’m glad you laid it all out on the table. How many pictures is enough? A smile on a child from a 3rd world country is deceiving. I don’t trust it. You will like this one about how to pose with children from poor countries. http://www.reductress.com/cutest-ways-photograph-hugging-third-world-children/ Cheers!